With 2014 now in full swing, there’s never been a better time to plan your social gatherings for the year ahead. Whether you’re welcoming old friends, hosting a family gathering or planning an unforgettable party, we have a range of affordable sofa beds to ensure a restful slumber. We've taken extra care to select a variety of contemporary designs to complement all décors. This is attributed to their clean, effortless lines which are the epitome of sophistication. Sink into the sumptuously padded Roma Faux Leather Brown Sofa Bed and feel a million dollars with the Napoli Faux Leather Sofa bed, complete with a sheen finish. These two seater sofa beds ooze style that is sure to impress all your guests. Incredibly easy to convert, they’re perfect for unexpected visitors. Just take the Lucca Black Sofa Bed, for instance, which includes a recline mechanism allowing you to pick from one of three settings; upright, lounge, to the fully converted sofa bed. It also includes two matching plump cushions adding to its undisputed cosiness. On the other hand, the Valencia Memory Foam Sofa Bed provides the ultimate in comfort. The memory foam padding guarantees the very best support to all those that grace this sleek, welcoming settee. The tapered stainless steel leg finishes the look. 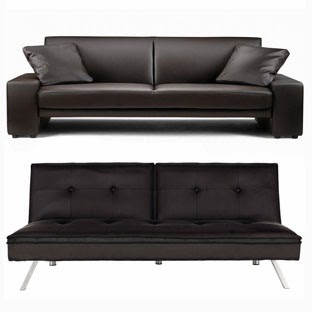 Our sofa beds are perfect if you’re limited on space or are the ultimate socialite! Choose from stunning two seaters to minimalist sofas with fabric upholstery, either way, we’re sure you’ll be wowed by our competitive prices.